Added on 09 August 2018 . By Anisah Audu. Move over pumpkin spiced latte, it's all about stunning views and warming cocktails at this autumn pop up. This heatwave has been a scorcher and we're already thinking about winding down to cooler months. Lucky for us, HarvestFest is coming to east London's Skylight next month, so those chilled nights aren't far off. 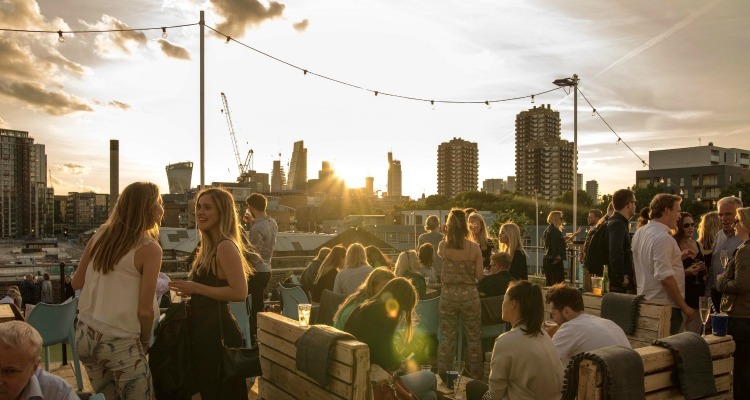 If you love a swanky rooftop, chances are you've already partied the day away this summer at Skylight above Tobacco Dock... but now you can do the same in seasonal style. Spread over three floors, you can tuck into street food, soak up thirst-quenching cocktails and play lawn games or watch a rooftop movie; all set to the gorgeous unrivalled view of the city's skyline. There will be blankets and heaters at the ready, so you can get cosy as the sunlit terrace becomes a warming space. Get stuck into a game of haystack skittles or pumpkin draughts, with a tasty apple cider or spiced hot toddy in hand. HarvestFest launches on Thursday 27th September 2018. You can find it at Tobacco Dock, Wapping Lane, London E1W 2SF. You can buy tickets for games including horseshoes and haystack skittles here.